Hyaluronic Acid is found naturally in the body; it is one reason that young people have smooth, plump skin. In fact, it binds up to 1,000 times its weight in water, thereby providing continuous moisture to the skin. Unfortunately, Hyaluronic Acid depletes as we age. I do love the vitamin C serum but this seems like it may be a winter alternative? 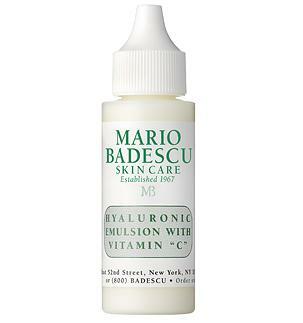 What’s the difference between the vitamin C serum and the Hyaluronic Emulsion with Vitamin “C” ? Do they both do the same-ish job? Which ones better? I’m curious what products you would recommend for using on the neck area. Aging skin wrinkles and tends to be drooping. Is there a product specific to this problem? Thank you for your inquiry. We think you will love our Vitamin A-D-E Neck Cream. 20 Minutes, France Oct. 18 Issue wrote, “For fighting wrinkles…IALUSET is the original skin repair cream. Rich in hyaluronic acid, it is considered by many women to be the best anti-wrinkle cream on the market.” This is great. Would you like to try a sample?